One of the books of the Protestant Apocrypha; entitled in some manuscripts "The Judgment of Daniel." The Greek text is extant in two recensions: that of the Septuagint (given only in the Codex Chisianus) and that of Theodotion. The latter is the one adopted by the early Christian writers and followed in the present common English translations. That it was in early times regarded as a part of the Book of Daniel appears from the fact that in most Greek manuscripts it stands at the beginning of that book; Jerome places it at the end of Daniel, with a notice that it is not found in the Hebrew Bible. It was accepted as canonical by the Christians generally up to the third century (its canonicity was disputed by Julius Africanus); and it is still so regarded by Catholics. Origen observes (in the "Epistola ad Africanum") that it was "hidden" by the Jews; but the precise significance of this remark is not clear, as there are no early Jewish references to the book (the comparison of a woman to a red rose, made in the Midrash on Lev. R. xv. at end, has no discernible connection with Susanna). 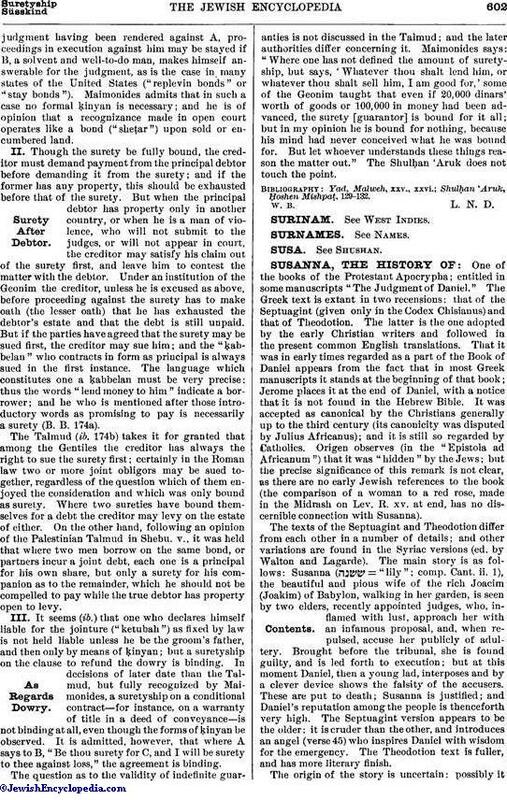 The texts of the Septuagint and Theodotion differ from each other in a number of details; and other variations are found in the Syriac versions (ed. by Walton and Lagarde). The main story is as follows: Susanna ( = "lily"; comp. Cant. ii. 1), the beautiful and pious wife of the rich Joacim (Joakim) of Babylon, walking in her garden, is seen by two elders, recently appointed judges, who, inflamed with lust, approach her with an infamous proposal, and, when repulsed, accuse her publicly of adultery. Brought before the tribunal, she is found guilty, and is led forth to execution; but at this moment Daniel, then a young lad, interposes and by a clever device shows the falsity of the accusers. These are put to death; Susanna is justified; and Daniel's reputation among the people is thenceforth very high. The Septuagint version appears to be the older: it is cruder than the other, and introduces an angel (verse 45) who inspires Daniel with wisdom for the emergency. The Theodotion text is fuller, and has more literary finish. The origin of the story is uncertain: possibly itrests on some tradition, but more probably is a pure invention suggested by facts of not infrequent occurrence (see Jer. xxix. 23, and comp. Koran ii. 96). The author's purpose is variously conceived: as insistence on carefulness in judging or as admonition to young men to be wise like Daniel (see verse 62 in the Septuagint). But it is unnecessary to suppose a definite moral. The story is a folk-tale in laudation of the famous prophet Daniel; and the moral, such as it is, develops naturally from the incidents. The booklet probably dates from the second or first century B.C. It appears to have been written originally in Greek: the style is flowing; and the Hebraisms are such as are found in the Septuagint. 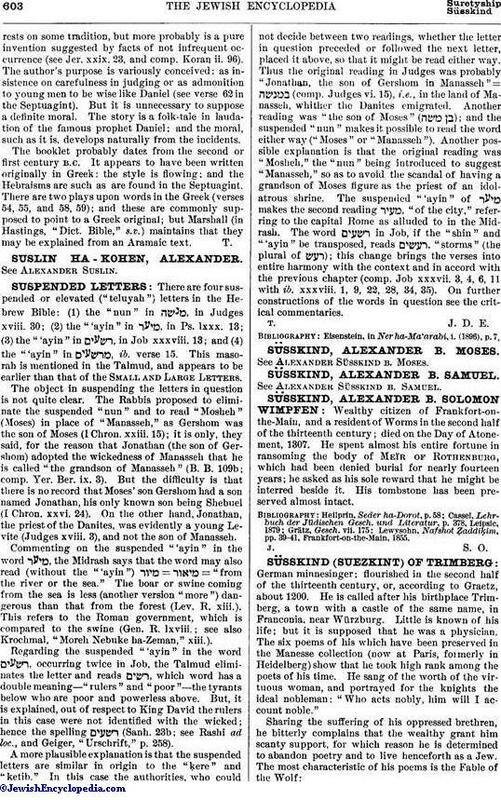 There are two plays upon words in the Greek (verses 54, 55, and 58, 59); and these are commonly supposed to point to a Greek original; but Marshall (in Hastings, "Dict. Bible," s.v.) maintains that they may be explained from an Aramaic text.